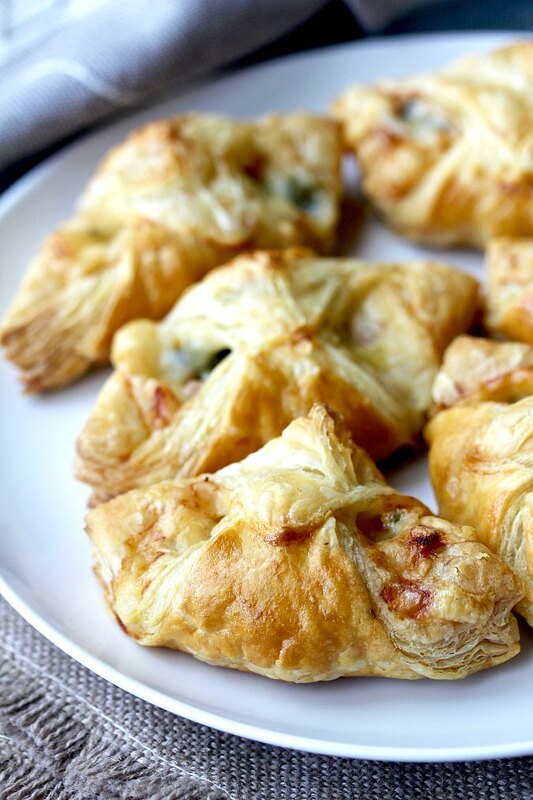 There is something magical about puff pastry. When it bakes, it puffs into layers and layers of crispy and flaky deliciousness. 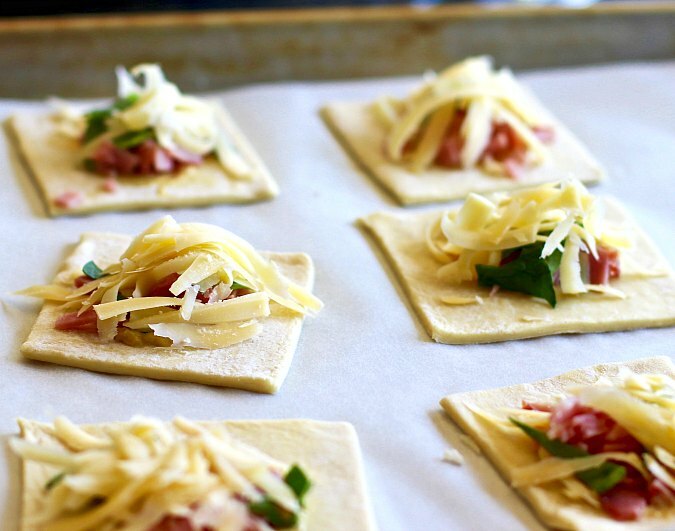 You begin with little squares of puff pastry, which you fill with spinach, ham, and cheese. Then, you fold up these innocent little squares of dough and place them in the oven. When they are done baking and emerge from the oven, you will have gorgeous little packets of cheese and ham deliciousness. 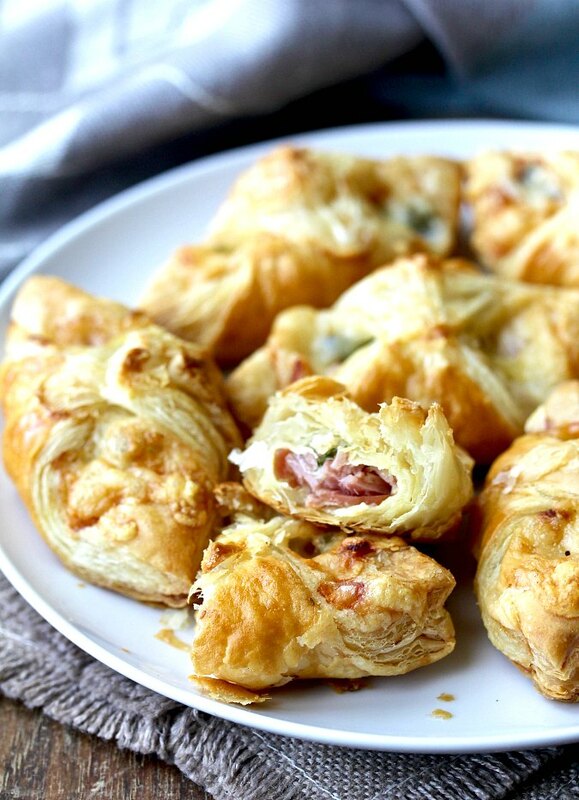 For these Cheese and Ham Bites, I used frozen puff pastry. It's such a miraculous ingredient, and so easy to use. I say this as someone who likes to try making anything once, including homemade puff pastry. 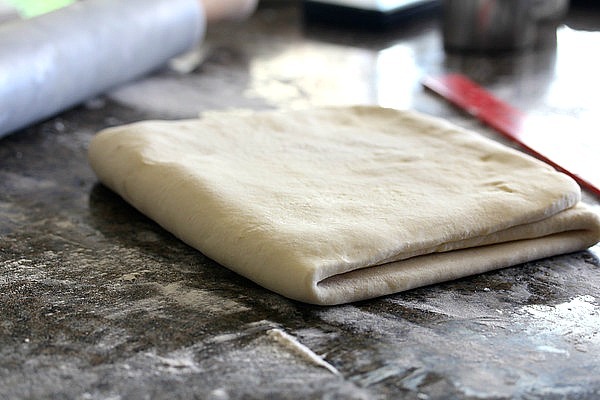 If you want to try your hand at making your own puff pastry, there are two ways to do it. First, there is the more traditional way, laminating dough and butter into thin layers, the way you would make croissants, but without yeast. The other way is to mix the ingredients in a food processor, and then fraisage the dough with the heel of your hand to create layers of butter. I've tried the lamination method, and was super happy with the results. If you'd like to try making your own someday, pin this post for later. Here's proof that I actually have made my own puff pastry. This is my actual kitchen counter with my actual rolling pin and ruler. Not that I'd ever think you'd doubt me! 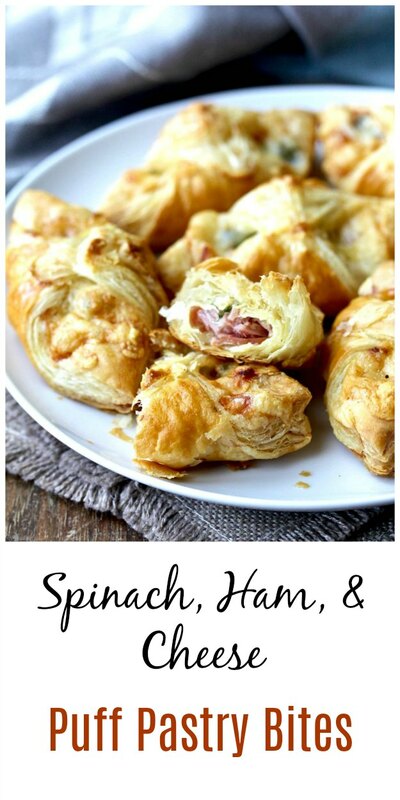 If you're having a cocktail party or if you've been assigned appetizers for a potluck, make these little spinach, ham, and cheese puff pastry bites! They will quickly disappear, and you will be wildly popular. Probably the most popular person at the party! For more great puff pastry recipes, try this asparagus and goat cheese tart, these cheese straws with parmesan, gruyere, and thyme, and this potato leek pie. You can also put "puff pastry" in the search box, and find many more. Plus, after the recipe, there are many more recipes from my favorite food bloggers using puff pastry, assembled by my friend Sue of Palatable Pastime. Line a large cookie sheet with parchment paper, and heat the oven to 375 degrees F.
Cut the thawed puff pastry sheets into thirds lengthwise, and then thirds widthwise. You will have 18 squares. Brush the center of each square with Dijon mustard. Divide the spinach among the different squares, and then the ham, and then the cheese. Fold one corner of the puff pastry over the other, sealing with a brush of the egg wash. Place the folded puff pastries on the parchment lined cookie sheet and brush with the egg wash.
Bake the pastries for about 20 minutes, until golden brown. Serve warm or at room temperature. Baking Bloggers is a friendly group of food bloggers who vote on a shared theme and then post about it once per month. If you are a food blogger interesting in joining in, inquire at our Baking Bloggers FaceBook Group. We'd be honored if you would join us in our baking adventures. I always keep a package of puff pastry in the freezer. It is so easy to pull out and make appetizers. Love the flavor profile of these beauties. Thanks Wendy. It is pretty cool what you can do with frozen puff pastry. Such fun little bites! I use frozen puff pastry so much that I haven’t actually attempted homemade yet. It is on my bucket list for someday. These look so good, I love these crispy bites. I too like making my own puff pastry sheets.